As a real estate agent I go on property tours of new listings every week. I love seeing homes that belong to gardeners as this one clearly was. 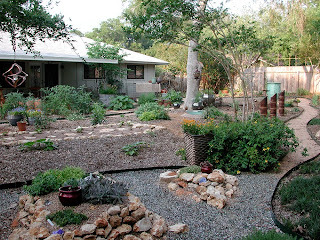 This home in South Austin had a xeriscaped yard with ornamental lettuces interplanted with perennials. There were beautiful crushed granite paths and a "pool" of blue glass. The inside was very nice as well with granite counters and a kitchen window that overlooks the garden. It was priced at $170,000.